Could your wardrobe use an overhaul or a few new items to spice it up? Have your children outgrown or worn out some of those once-new “back to school” clothes? Craving a change around the house furniture or decor wise? You’re in luck because now’s the prime time to start hitting the secondhand shops in your area to snag some great deals on “new” items without forking over too much cash. Chock it up to new year’s resolutions, simply an excessive amount of stuff cluttering up households or one last shot at increasing their charitable donation deductions before the year is over, post-holidays many people flock to thrift shops in an effort to unload the things they no longer want or use. This means a number of things for the savvy shopper looking to snag a deal: a mountain of novel inventory at a variety of secondhand shops and a higher probability of even more steeply discounted prices and specials as store owners try to move the excess of inventory their stores have been inundated with. Truly a win-win savings situation! A little known secret, too, is that many retailers have now also begun making charitable donations to local thrift stores. 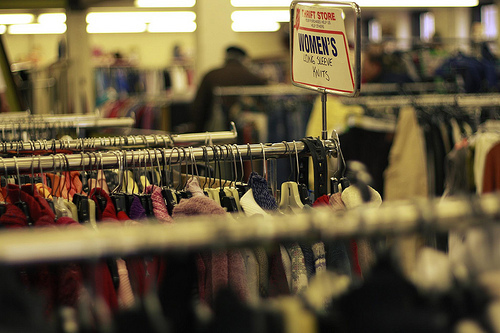 Once a discounted item fails to sell on the retail shelf, it often becomes more financially beneficial for business to donate to charities and take the deduction as a loss or deduction themselves. This can mean a great opportunity to snag brand spankin’ new items at a price that’s practically a steal. One the secondhand shelves in my neighborhood, I’ve seen everything from (still sealed) containers of brand name lotions and perfumes, unused candles and even unopened boxes of resealable sandwich baggies and straws. Ever wonder what happens to the returned items that retailers take back from consumers, but can’t sell back on their shelves? A trip to a thrift store during this time of year will answer that question. Whether it’s due to damaged packaging or small cosmetic flaws, many items that are returned are still completely usable but not up to retail store standards. When this is the case, it’s off to the secondhand stores they go. There these items wait patiently sporting super great prices waiting for savvy shoppers waiting to snag super deals. But they likely won’t wait long, so if you’re on the hunt for anything in particular, consider making a few trips out to such shops during the month of January and February to increase your chances of finding exactly what you want at a price you’ll like even better. Another great way to cash in on these mountainous savings and incredible secondhand opportunities is by hitting the toy department. In an effort to make more room for the stuff Santa dropped off, many parents purge their children’s existing toy stash. If your child has a beloved toy that’s missing a few pieces or is in need of a few new parts, you may be able to find the necessary replacement(s) by passing through the toy aisle in your local thrift store. A few minutes spent looking and a few bucks forked out may save your child the heartache of parting with a favorite and you the cost of purchasing a brand new replacement. It’s definitely a great time to hit up the thrift stores. I’ve also seen some great deals on clearance items at the regular stores and online too.